How do you make your brick-and-mortar stores as smart as your website – so when customers walk in the door, you recognize them and cater to their individual tastes? What’s the key to making in-store shopping as frictionless for your customer as online shopping? Read this research summary from the International Institute for Analytics to get started. 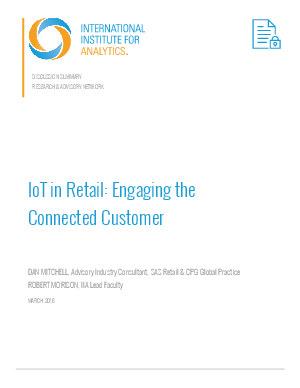 You’ll learn how to use analytics to gain advanced insight from the Internet of Things: tracking chips, in-store infrared traffic monitors, interactive kiosks and customer mobile devices, to name a few. With analytics, you’ll identify who’s walking in your store, understand their behavior and preferences, and create engaging experiences for your connected customers at every turn.